In a couple of weeks two colleagues of mine are walking 100 kilometers non-stop in the Oxfam trailwalker challenge. They need to walk the 100 km within 48 hours as a team of four, and the money they raise will help to overcome poverty and injustice around the world through Oxfam’s programs and services. Their team is named “Keen Beans” and you can donate to their team here. I helped them out last week by cooking soup for a soup kitchen at work, which was lots of fun, except that I had a very busy week in the lead up and ended up cooking 120 serves of soup the night before! My valiant oldest son stayed up to help me chop up ingredients but it was a very late night (actually 2 am, if the truth be told). However, I loved every minute of it and soup has not palled at our place, even after that experience. 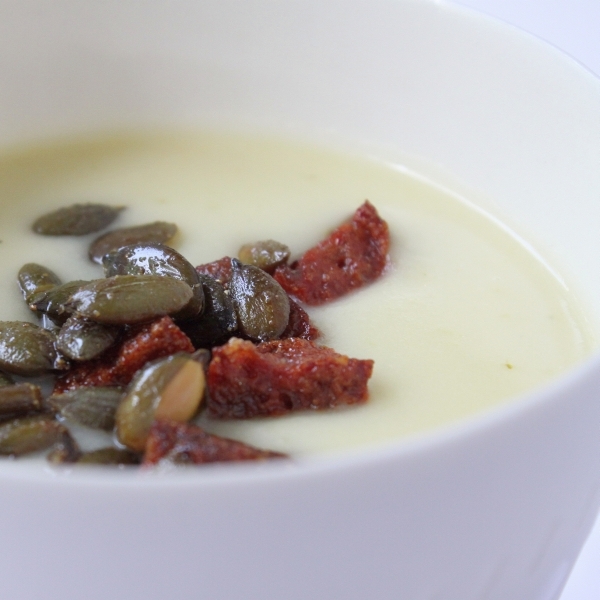 This potato and leek soup, with a hint of apple and topped with spicy chorizo and pepitas was on the menu this weekend. The apple gives a faint undercurrent of sweetness and the crunchy toppings were a perfect foil to the smooth and creamy soup. Hearty and warming, it’s just what a hiker needs at the end of a chilly walk in the bush. In a large saucepan, saute the leek, potato, garlic and apple in the olive oil until the leeks are softened, about 5 minutes. add the chicken stock. bay leaves and rosemary and bring to the boil. Turn down the heat and simmer for around 25 minutes, or until the potatoes are very soft. Heat oven to 180 C. While the soup is cooking toss the pepitas with the coriander, cumin and olive oil in a small bowl until they are well coated. Turn on to an oven tray lined with silicon paper and cooking the oven for around 10 minutes. The pepitas will become crispy and infused with the spicy oil. In a small non-stick pan, cook the chorizo until it is crispy . When the soup is done, remove the bay leaves and rosemary and process the soup using a stick blender or food processor, until it is really smooth. If you want to be a bit fancy you can pass the soup through a sieve to get a super smooth final result. Return the soup to the pot and add the cream. Bring almost to boiling point, check the seasoning and add salt to taste. Serve at once with the chorizo and pepitas sprinkled over the top. What a beautiful picture! And the soup sounds wonderful, too.